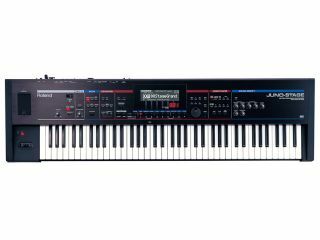 Roland has unveiled the Juno-Stage - a new hardware synth that's been designed specifically for live performance. We're assured that the Stage features a versatile soundset - the fact that a stereo multi-sampled piano is included suggests that it isn't just a keyboard for electronic musicians - and this can be played from the 76-note keyboard. Pianists would probably have liked 88 notes, but by restricting the keyboard to six octaves, Roland has been able to keep the size and weight down (important considerations for gigging players). If you're not happy with the soundset as it comes, it can be augmented with two of Roland's SRX expansion cards. The Juno-Stage's live performance credentials are enhanced by the inclusion of an extra-large LCD display - you don't want to be squinting at a tiny screen in the heat of musical battle - and dedicated reverb/EQ knobs. There's also a click output for drummers and hands-free patch select footswitches. When you're back in the studio, the Juno-Stage can be switched into MIDI controller mode with the press of a button. Initial reports suggest that the Juno-Stage will retail for £1,049, though when it'll be released, we're not yet sure. You can find out more at the product page on the Roland website.